We knew our future neighborhood when we saw it. On our first visit to Montgomery, I was very excited to live close to the Five Points area. We could walk to the Capri! Or to Capitol Book & News! And for a while, this came to pass. We’d take the dog up to Cafe Louisa, or to grab pizza at Tomatino’s, or meet friends at El Rey. There even used to be a cute little jewelry shop, and the crafts on display at M. Bagwell. Later, there was an adorable local hair salon. 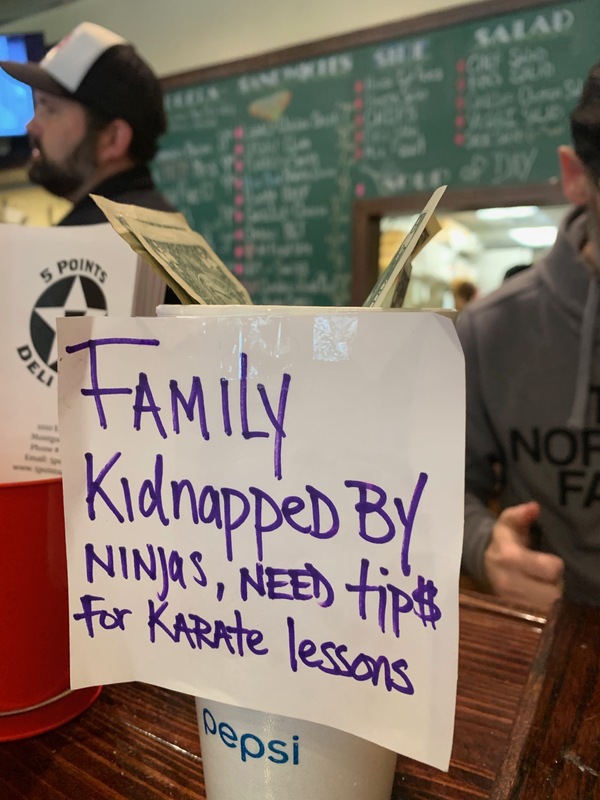 But of late the area’s fallen on some hard times, as pizza and coffee decamped to Old Cloverdale (not begrudging them the sweet new place, to be sure), the home brewing place moved away, and the little boutique sputtered for a brief moment. And it seemed like everything was going to close down on the south side of the street. The shoe repair place survived, as did Sandra Nickel’s bustling real estate empire, and of course there’s always Bud’s, but there sure continue to be a lot of empty store fronts there. We hear talk – talk of another branch of Sa Za, talk of a neighborhood pub. But there’s nothing so far, although we’re still hopeful. And El Rey persists, busy as ever. But other than Moe’s (RIP Sinclair’s), there wasn’t a place to just grab lunch in the neighborhood. 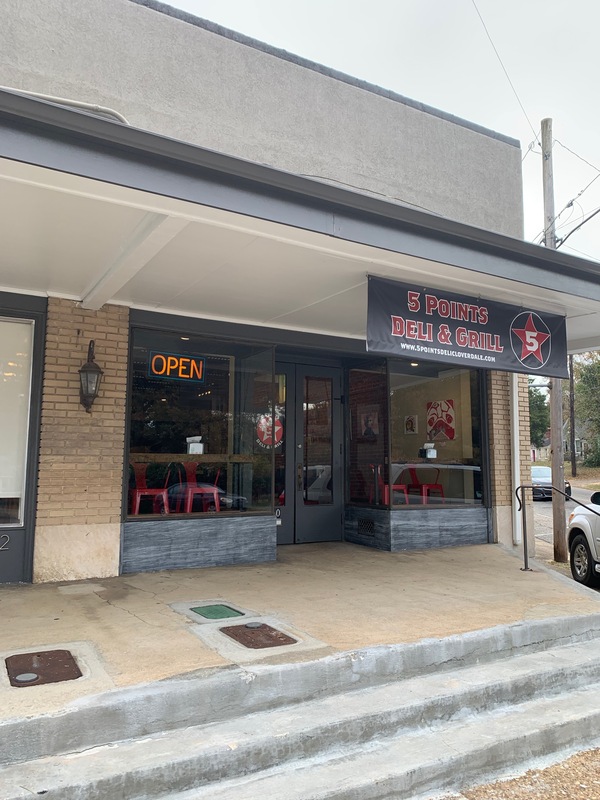 Until Five Points Deli and Grill opened, and there was much rejoicing. 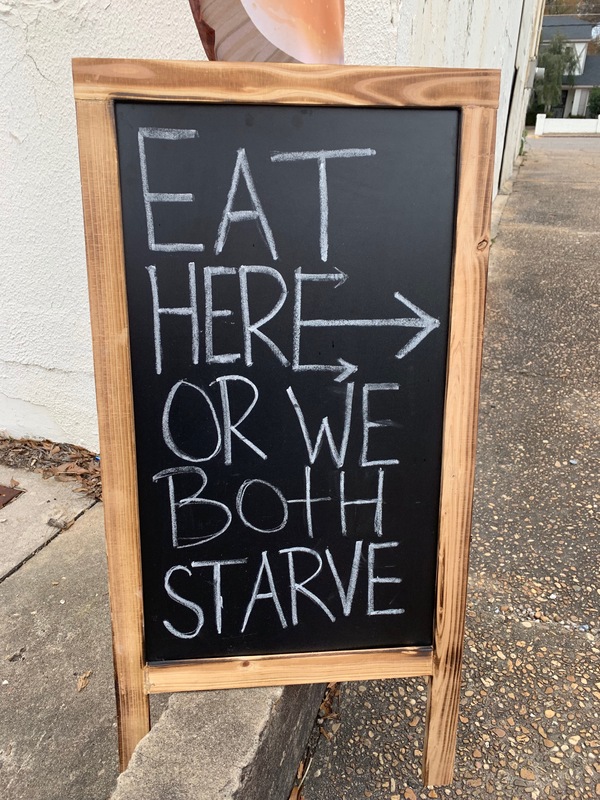 I met a friend there for lunch a little while ago, and the place was pretty slammed – a good sign for their developing business. It’s a cozy spot, decorated with local art (most of which is for sale). The menu’s up on a big board behind the cash register, and the guys working there were super friendly and eager to take our order. There are burgers, salads, sandwiches, and sides – pretty much basic lunch fare, though there are a lot of ways you can dress up your burger, if you’re so inclined. If you’re vegan, you’re pretty much out of luck here. 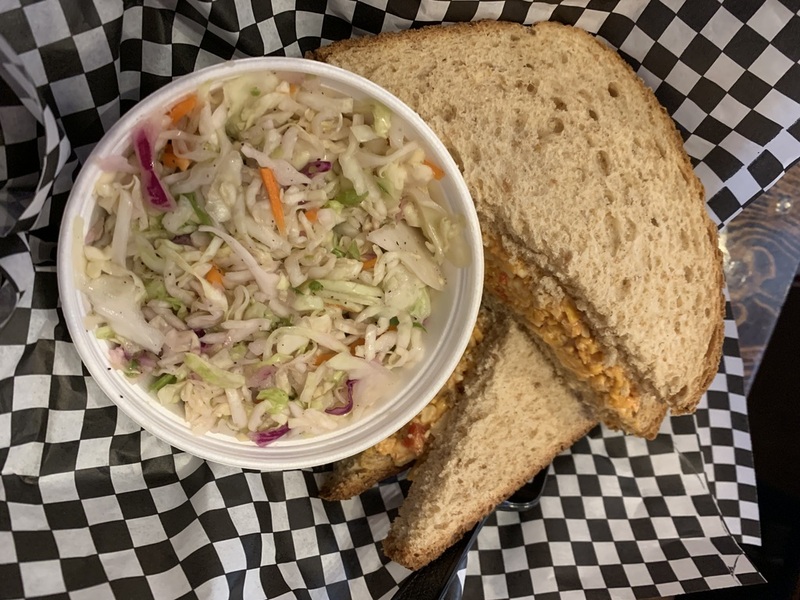 And the vegetarian options are a grilled cheese sandwich, a grilled cheese sandwich with peppers and onions, and a pimento cheese sandwich – not exactly an astonishing variety. 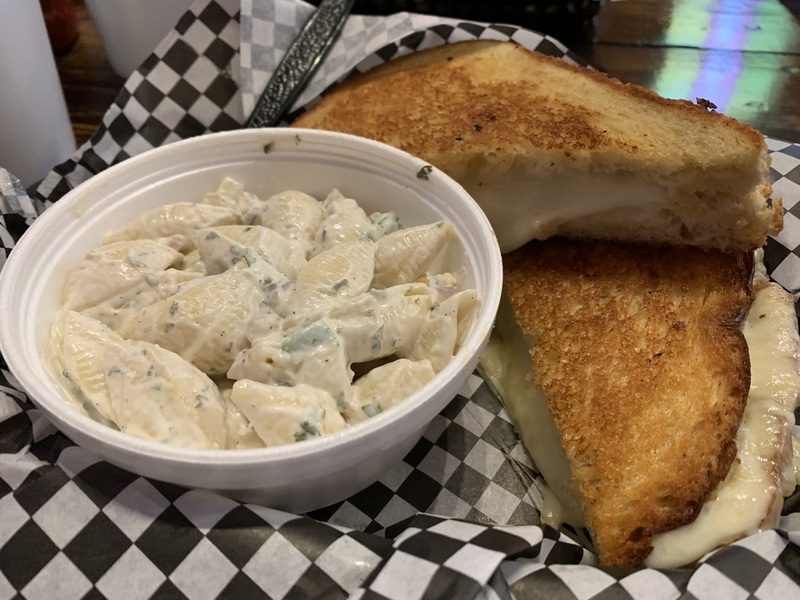 But it’s better than the tiny plastic cups of meat-laced veggie sides at Moe’s — and sometimes a hot, buttery, melty grilled cheese is exactly the right thing, especially on a cold day. Mine was delicious. My companion had the pimento cheese sandwich and pronounced it both good and enormous (she took half to go). It’s local, fast, inexpensive, and good. We hear the burgers are good, too. And there are hand-cut fries! We’d love it if they started to stock a veggie burger option. 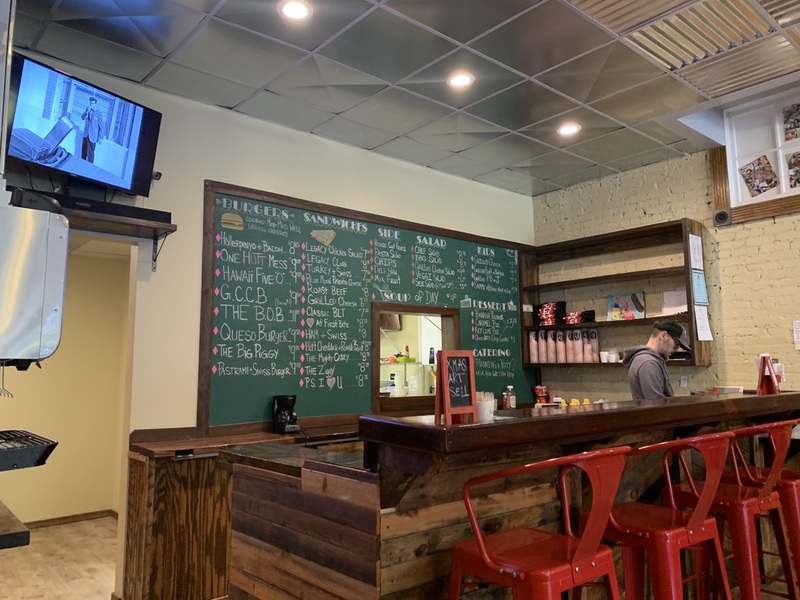 But it’s a great addition to the neighborhood, and we’re very much hoping that it both thrives and spearheads a movement to occupy that great real estate. Here’s to a Five Points revival!